Medicine being inserted into an intensive care patient's intravenous drip. A low dose of the sedative dexmedetomidine given at night may prevent delirium in critically ill patients, researchers say. Results of a randomised placebo-controlled trial, thought to be the first of its kind to identify a drug to prevent adults developing delirium in intensive care (IC), were published online in the American Journal of Respiratory and Critical Care Medicine. 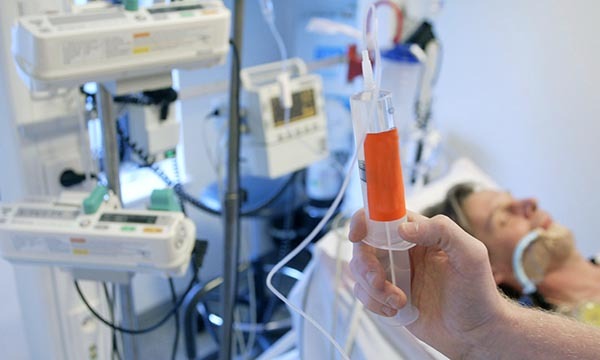 The study covered 100 patients in intensive care at two hospitals – one in Quebec and the other in Boston – none of whom had delirium at the time of enrolment. Half the patients were randomly assigned to receive intravenous dexmedetomidine and the other half were infused with the placebo. The study found that compared with the placebo group, those receiving dexmedetomidine were more likely to remain free of delirium throughout their ICU stay: 80% as opposed to 54%. Study author Yoanna Skrobik said: ‘In other studies, dexmedetomidine has been associated with lower delirium prevalence rates than other sedatives. ‘But whether dexmedetomidine might actually prevent delirium was not clear.